Light filled home in Coventry on English Hill. The flowing floorplan features 4 bedrooms, 2.5 baths, 2220 s.f. on a private south-west facing 7,627 s.f. lot. The 2-story vaulted entry and hardwood floors welcome you in. Formal living room with big windows and vaulted ceiling. Formal dining room with hardwood floors and serene garden views. Well designed kitchen features generous oak cabinets, newer appliances including a double convection oven, and large windows overlooking the private, park-like backyard! The eating nook has a slider to the patio – perfect for entertaining or BBQing. The family room has large windows, built-in shelving, and a wood burning fireplace. The expansive laundry room features front load washer & dryer, generous storage cabinets and abundant counter space. The spacious master suite has beautiful views of the tree lined rear yard and a walk-in closet too. The master bath features a double vanity, large soaking tub with a shower above and a sunny skylight. Three additional bedrooms are spacious with closet organizers & garden views. The full bath in the hall is finished in tile and is drenched in light from a skylight. Entertainment sized patio overlooks the private rear yard. Large lawn provides room for play. Mature, lush plantings & ample garden beds will satisfy any gardener. Storage shed for gardening supplies. Attached two car garage with large storage area above. All appliances included. Outstanding Northshore schools – Sunrise Elementary , Timbercrest Jr High & Woodinville High. 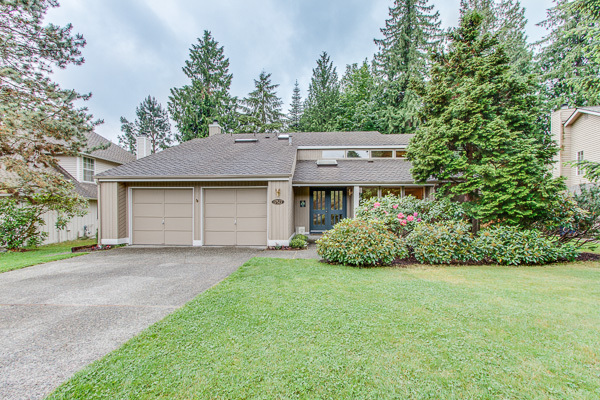 Easy access to Microsoft, AT&T, freeways, shopping, Redmond and Woodinville! Tony showed us houses both in the Eastside and in Seattle, and he was knowledgeable on both areas, and was able to help us weigh the pros and cons of both areas. When we finally found the house we wanted, Tony was willing to give us advise on what to offer, but he did not force us to do anything we didn’t feel comfortable with. He even offered us options we weren’t aware of. I truly believe that we got our house thanks to Tony’s calling the seller agent and being on top of things, as the seller’s agent was very slow in replying and did not notify us that there was another offer until Tony called her a few times. Once the offer was accepted, Tony was on top of things. He was very quick on returning phone calls, and on calling us to let us know where we were in the process. One of the things I really liked about working with Tony was that he never steered us in any one direction (He never said you should live in the Eastside, or do not ask the seller to fix that), he always listened to our concerns, and he was able to give us advise whenever we needed it. Some people say that buying your first house is a very stressful experience. I believe that Tony helped make this process a lot less stressful and even fun for us.